Three miles east of Aberfoyle in the heart of the Trossachs is the Lake of Menteith, a regular feature in Scottish trivia quizzes as the answer to the question "What's the only lake in Scotland?" It is arguable that the correct answer to that question is that there are no lakes in Scotland: there just happens to be a loch called "The Lake of Menteith". Indeed, the original name for this stretch of water was the Loch of Menteith. The change occurred at some point in the early 1800s. No one seems to know exactly when or why, though theories include the many English visitors being drawn to the area by Sir Walter Scott's novels at the time; the (arguably) rather English look of the loch; or a slip of a pen by an early map maker. It's as if people just looked round one day and realised the name had changed without their actually noticing it happen. Not far from the hotel (and accessible via its own turning from the road) is the Historic Environment Scotland pier from which you can catch a small ferry for the seven minute trip to the island of Inchmahome, to visit Inchmahome Priory. You are unlikely to be alone on the lake: it is common to find it dotted with small green motor boats occupied by fishermen in tweeds and Barbour jackets. While en route to the island, try to imagine the loch as the location of Scotland's only outdoor curling tournament, known as the Bonspiel or the Grand Match, held between clubs in the north and south of Scotland. This takes place whenever the thickness of winter ice permits, which in practice means that the ice has to be 7 inches thick with continuing signs of frost. The last time this happened was on 7 February 1979 when 12,000 players and spectators descended on the Lake of Menteith; the time before that was in 1963. A match nearly took place in January 2010, but was called off at the last minute on safety grounds. On arrival at Inchmahome's small pier you immediately become aware of the remarkable sense of tranquility and other-worldliness that pervades the island. The substantial ruins of the priory occupy the northern side of an island that measures no more than about 200 yards in any direction. Apart from the priory and its surrounds, most of the island is heavily wooded, and a walk around the circular path that follows the shore is a good way of getting your bearings. En route you see some truly magnificent trees, including some rare specimens and some that over centuries have distorted into truly remarkable shapes. And if you time it exactly right, for a few days each year you can also find the island of Inchmahome completely and beautifully cloaked in bluebells. You can think of priories as small scale abbeys. But they could still be pretty substantial, as the remains at Inchmahome show. Priories and abbeys typically followed a similar pattern, and this, too is clearly in evidence at Inchmahome. As you land on the island, the first structure you see is the priory church, aligned east-west on the northern side of the priory, which itself is on the north side of the island. 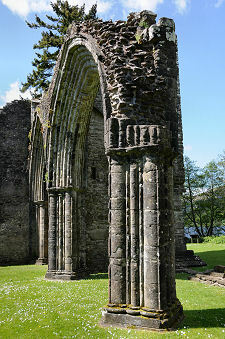 The church would have been the tallest building in the complex and it was usually placed on this side to avoid casting the rest of the priory in shadow. The east end of the church at Inchmahome is well preserved and the east window much have been magnificent. There are also the remains of a bell tower at the north west corner, plus some very pretty arches that once separated the nave from a north aisle. The west doorway is still impressive, and the interior of the priory church is home to a number of graves and memorials added after the Reformation. To the south of the priory church, beyond its oddly dog-legged south wall, is the heart of the priory, the cloister. Most of the south and west ranges that once stood on two sides of the cloister have now gone, but the east range is reasonably complete (as ruins go). The walls of the warming house still stand to a good height, and vaulting still covers the kitchen. The best preserved part of the priory is the chapter house, largely because it was converted into a mausoleum by the Graham family in the 1750s. 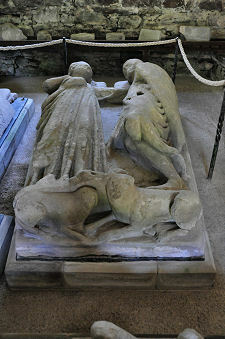 Inside are examples of some of the decorative stonework found around the priory, plus some superb medieval effigies brought here for safe keeping from the priory church. 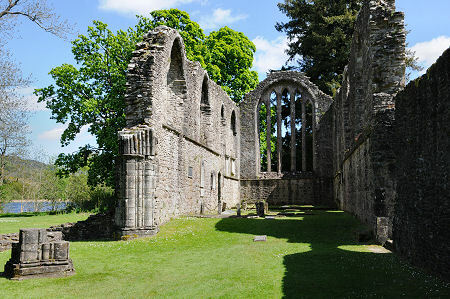 Very few written records remain of life at Inchmahome Priory. 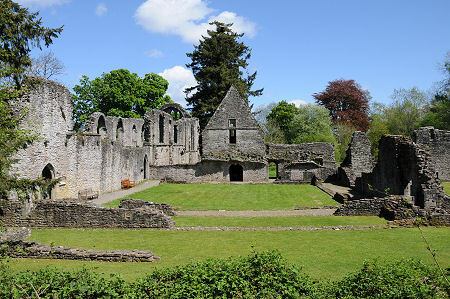 In common with other similar establishments across Scotland, its life as a priory came to a juddering halt with the Reformation in 1560. In the twilight of its days, in 1547, it achieved a small footnote in history when the four-year-old Mary Queen of Scots was brought here for safety by her mother, Mary de Guise, after the Scottish defeat by the English at the Battle of Pinkie, east of Edinburgh. 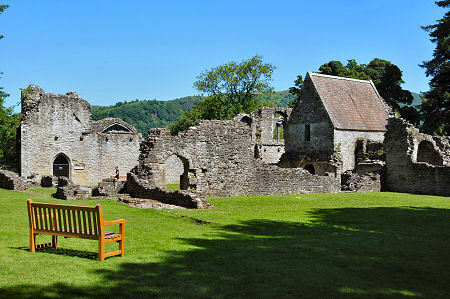 By that time the priory was over three hundred years old. 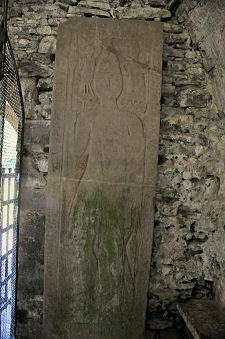 There was probably already a chapel on Inchmahome when Augustinian canons came here from Cambuskenneth Abbey near Stirling in 1238 to found the priory, which had been authorised by Pope Gregory IX on 1 July that year. 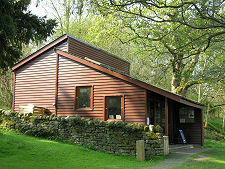 You get a glimpse of the reason for the choice of its location on your tour round the shore of the island. South west of Inchmahome is the much smaller island of Inch Talla, where the priory's patron, Walter Comyn, Earl of Menteith, one of the most powerful men in Scotland at the time, had a residence. Glimpses of the ruins of his castle can still be seen. Although the Earldom of Menteith passed from the Comyn family to the Stewart family with the demise of the former's fortunes in the early 1300s (see our Historical Timeline), it seems this made little difference to the day to day lives of the canons living here. So for 322 years the dozen or so canons plus assorted lay brothers and servants living at the priory simply got on with their job: of praying for the eternal souls of the priory's patron and his family. STB 3 Star Historic Attraction.